SURPRISE! 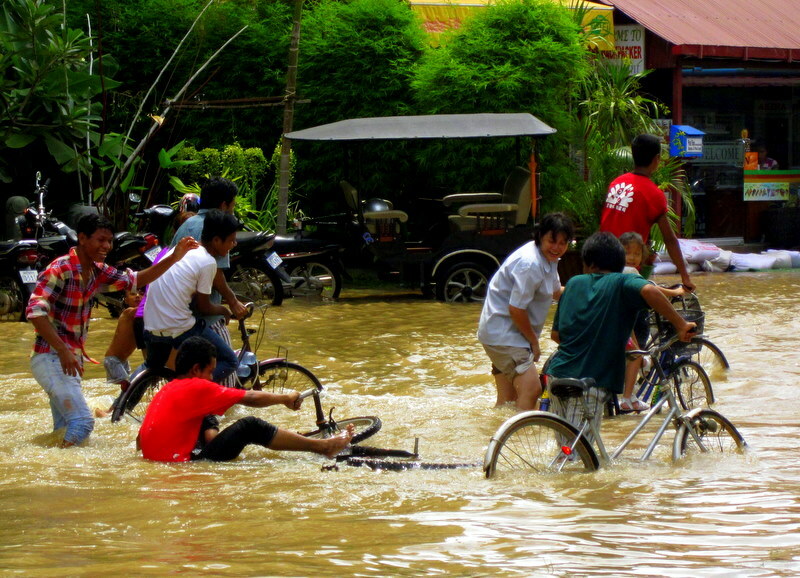 The town was completely flooded. 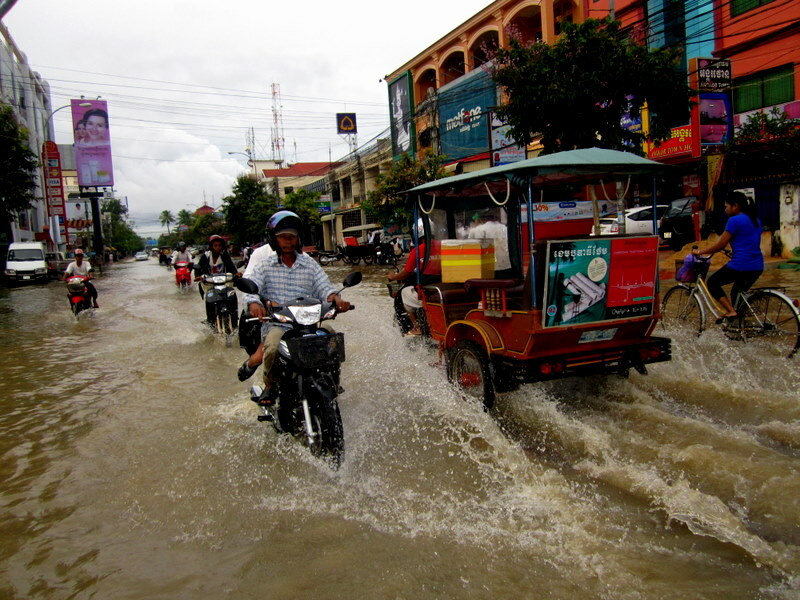 Apparently, once every few years, the Siem Reap River overflows into the town, causing minor damage and slight discomfort. 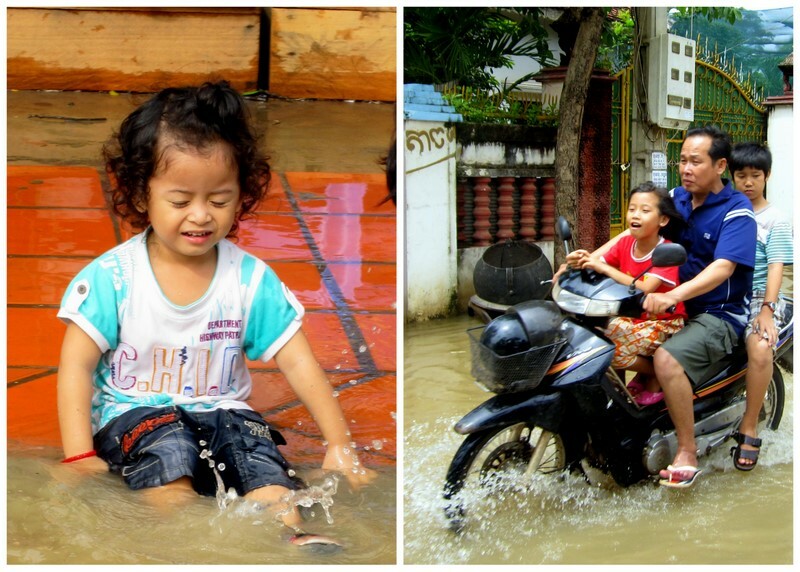 This year, however, the flooding was worse than ever before, and according to a recent article in the Phnom Penh Post, Siem Reap is still under water today- 3 full weeks after our visit! Unbelievable. 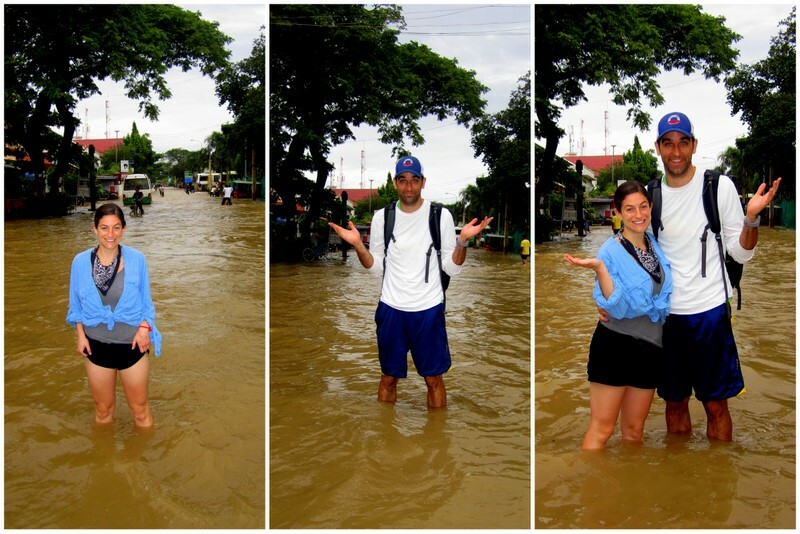 I can’t speak to the current situation in Siem Reap (which I am sure is extremely uncomfortable and unsanitary), but when G & I were there, the locals seemed to deal with the knee-deep water with a “keep calm and carry on” approach. It was business as usual in this watery town. 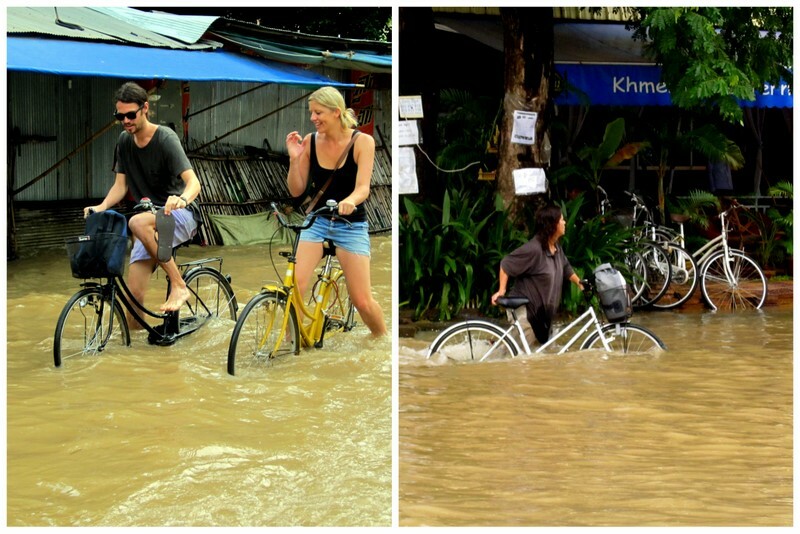 Some Cambodians were even enjoying the floods. 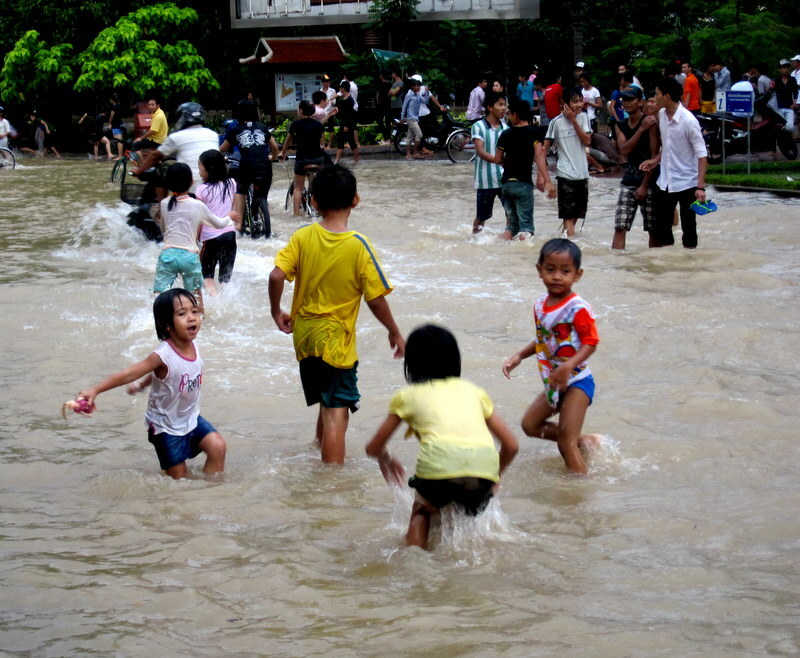 I could have easily spent the entire day walking/swimming down the streets, snapping photos of the beautiful Khmer (Cambodian) children playing in the muddy water, but alas, there were temples to be seen and G & I wanted to reach Angkor Wat before the flood did. 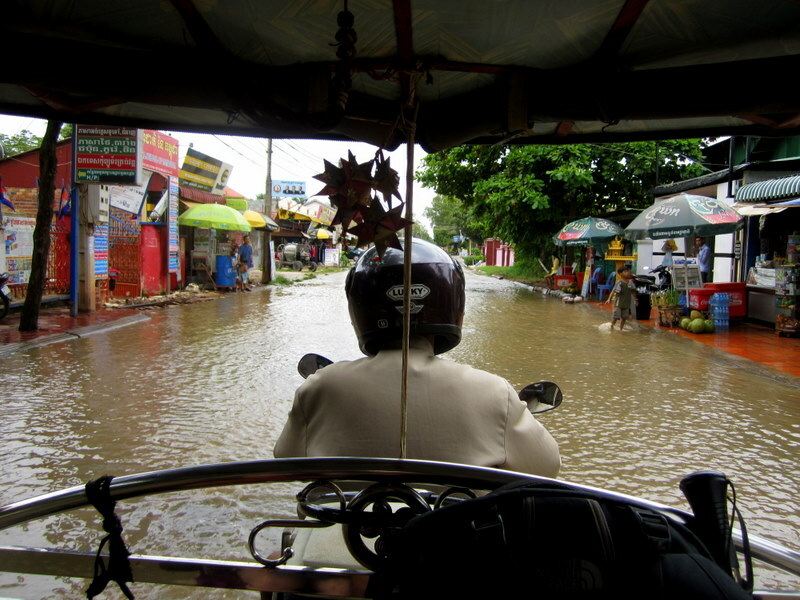 So, we were off like a herd of turtles to visit the temples in our little tuk-tuk. 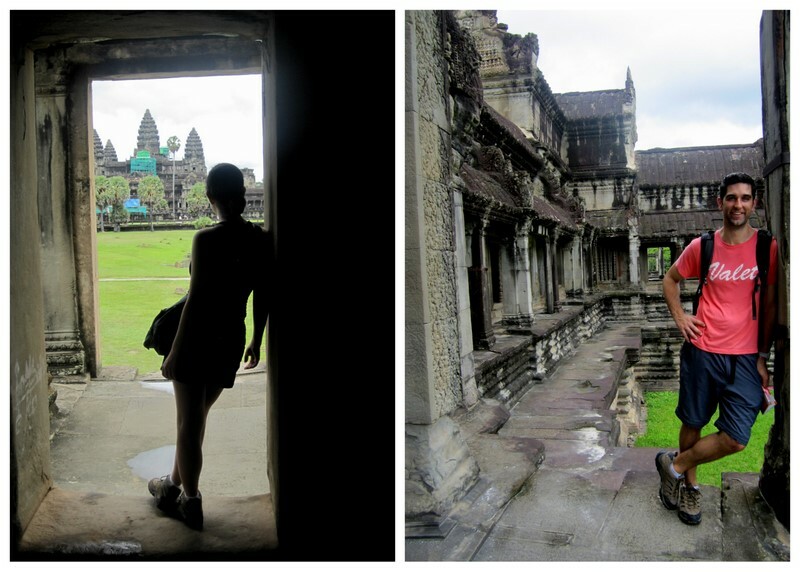 Our first stop was the spectacular Angkor Wat, the heart and soul of Cambodia. 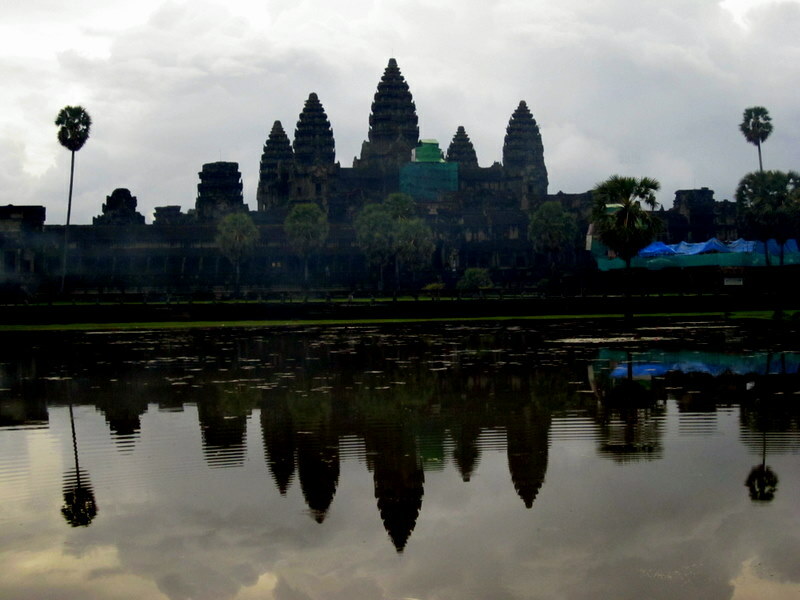 Built during the early 12th century for King Suryavarman II in honor of Vishnu, the Hindu deity, Angkor Wat is believed to be the world’s largest religious structure- first Hindu then Buddhist. 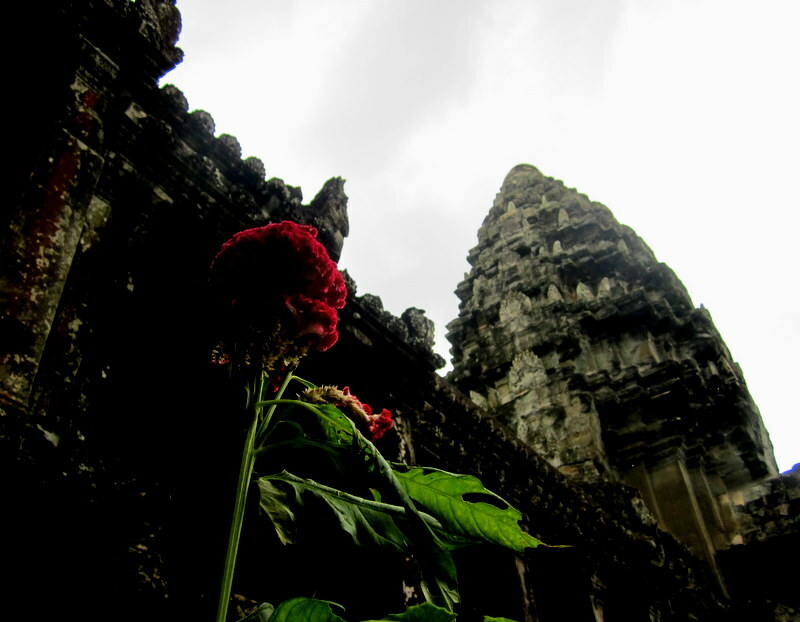 The temple towers above the surrounding lush and noisy jungle, making its scale even more dramatic & breathtaking. I was especially magnetized by the detailed sandstone carvings & sculptures on the outer walls of the temple, which span 1 kilometer in length. 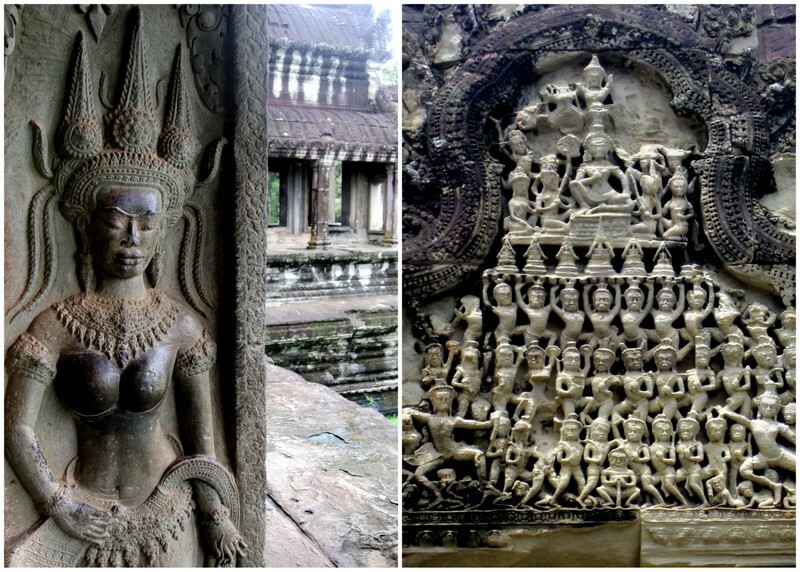 Most of the bas-reliefs depict epic events in Hinduism, like victorious battles, heavens & hells, as well as over 3,000 enchanting and unique apsaras (celestial nymphs). 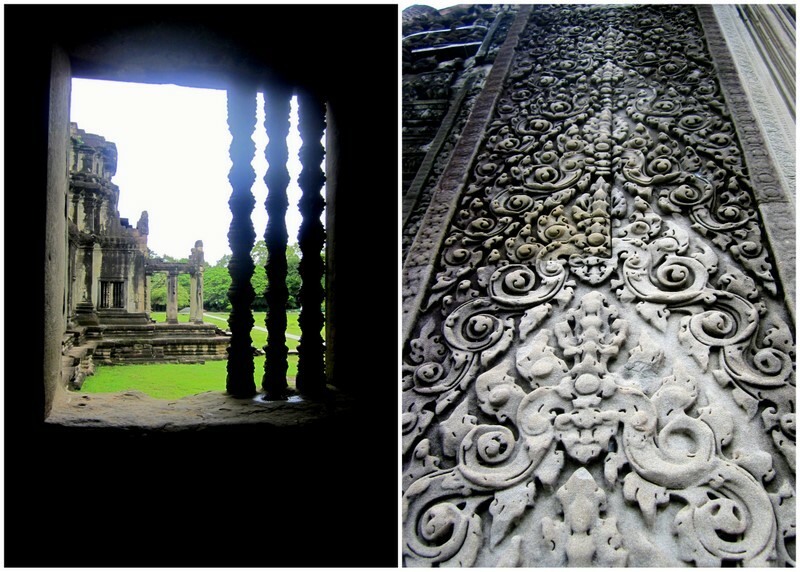 After marveling at Angkor Wat’s grandness (and it is grand), we headed to the neighboring city of Angkor Thom- made famous by Angelina Jolie’s film, Lara Croft: Tomb Raider. 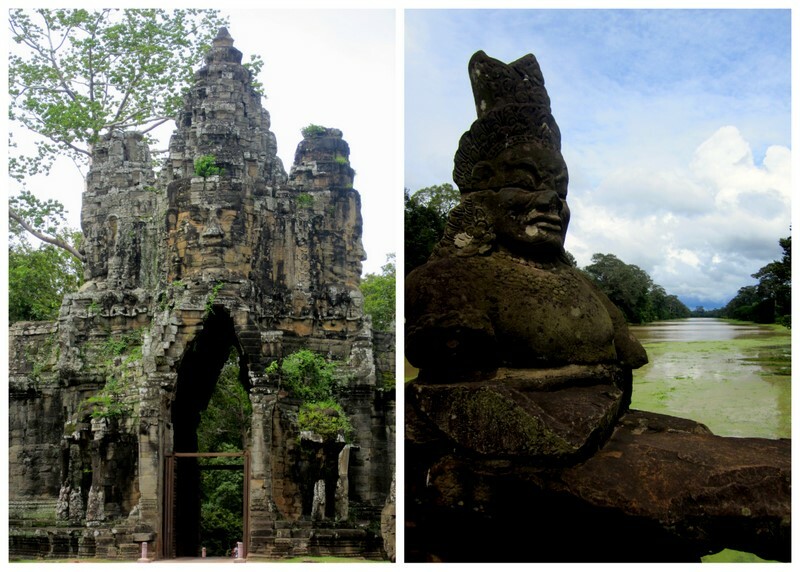 Angkor Thom was the last great capital of the Khmer empire, built by King Jayavarman VII and protected by 8 meter high walls and a 100 meter wide moat (rumored to have been inhabited by crocodiles back in the day). In the exact center of Angkor Thom is the temple of Bayon, a 3-level structure decorated with 216 enormous faces with sardonic grins. 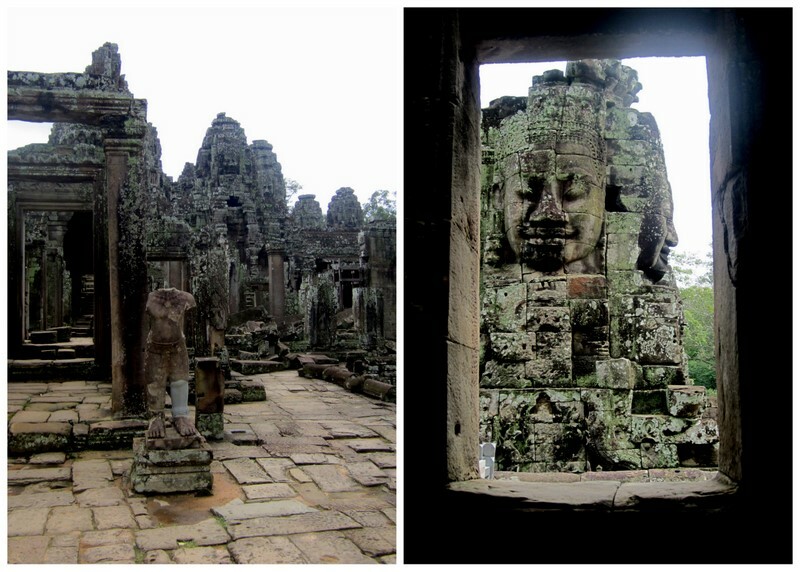 The faces of Bayon are supposed to be images of Avalokiteshvara, but in fact, they are said to resemble the King Jayavarman VII even more. 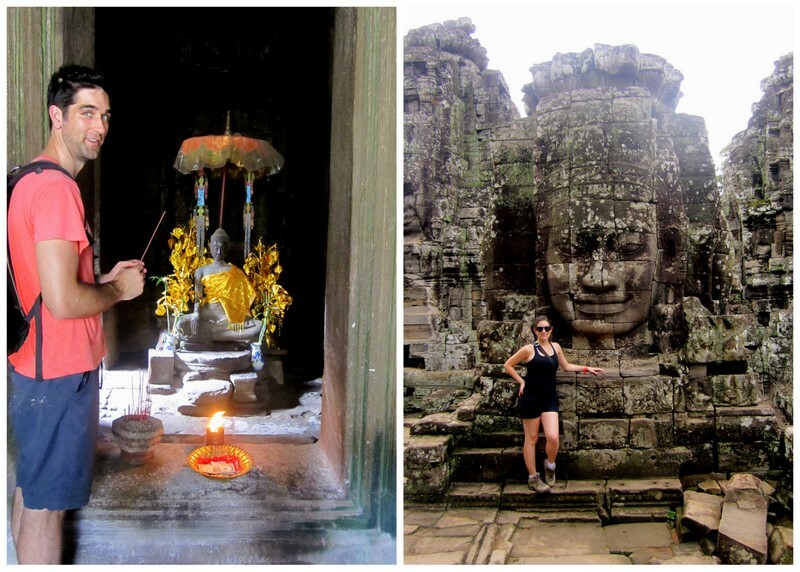 From Bayon we went off to explore 5-6 other temples, the most famous being Ta Prohm, one of the locations for the movie, Tomb Raider. 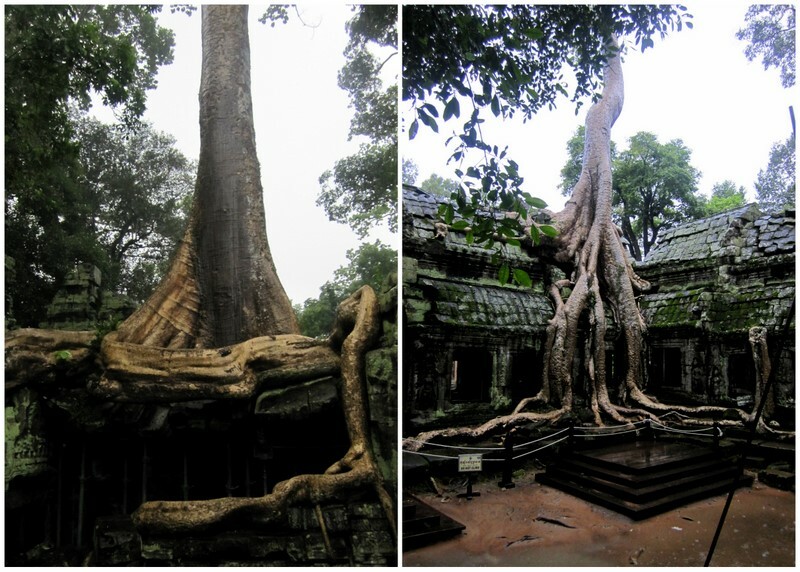 Unlike other Angkorian temples, Ta Prohm has been left in almost the same condition as it was found- swallowed by the Cambodian jungle. 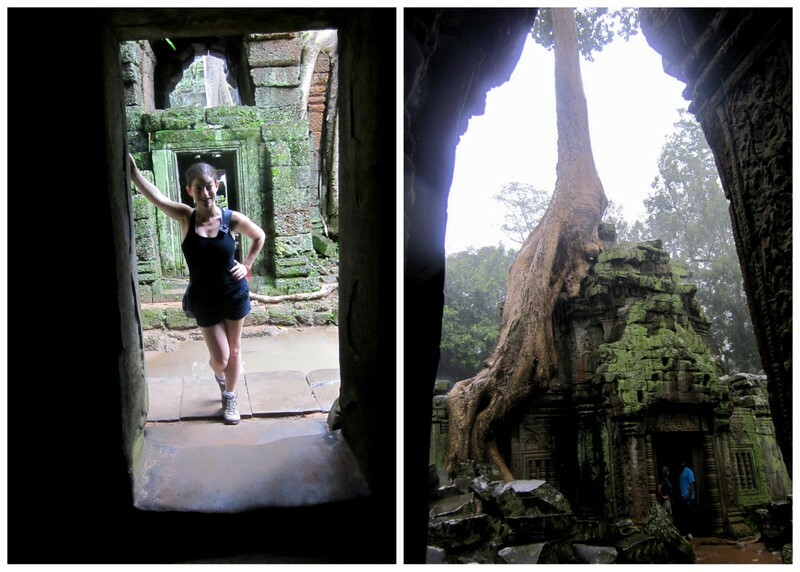 Even though it was POURING rain as we walked through Ta Prohm (hence the bad photos), G & I were awestruck by the power of the jungle- emerging & climbing throughout the temple. The amazing coexistence between nature and temple is what makes Ta Prohm truly magical & a perfect ending to a day among the great Angkor Temples.